If you have anywhere from 10-150 passengers and are looking for a luxury wine tour, our buses will exceed your expectations. 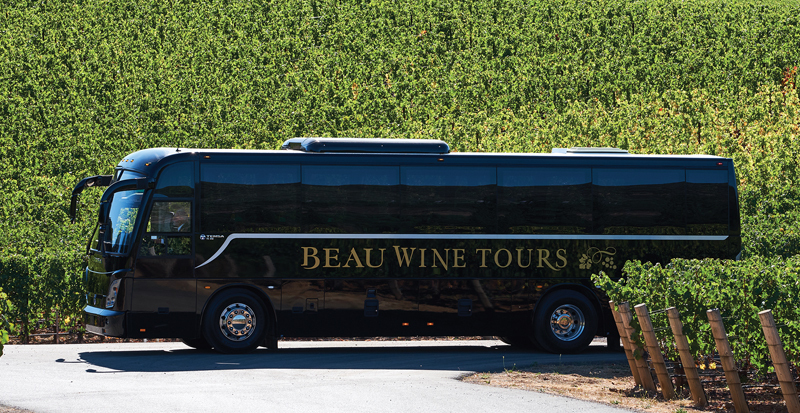 Beau Wine Tours takes the extra steps to ensure your comfort during a well-rounded wine country experience. Our tour specialists work with you to develop a custom route, depending on the timeframe you choose and which wineries or regions you would like to visit. Historic Tours – Our California historic tours visit sites dating back to the first wineries of the region. Architectural Tours – If your group has an interest in incredible architecture, we can take you to some of the many local wineries known for their noteworthy design. Garden Tours – Horticulturalists and garden lovers are attracted to this area for its many varied and beautiful grounds; we look forward to showing you them! Art Tours – Our experienced tour guides will enlighten you about the art displayed at wineries, parks, and public areas throughout the area. If you have anywhere from 21-400 passengers needing to be transported from one event to another, we offer executive shuttles and coaches that are well equipped for your group. Maybe you have a large wedding party or are attending a golf tournament? We can help plan the best way to accommodate your group. Experienced and passionate drivers who are excited to show you Napa Valley. A smooth ride that is comfortable and fun. Exceptional lunch and dinner options. 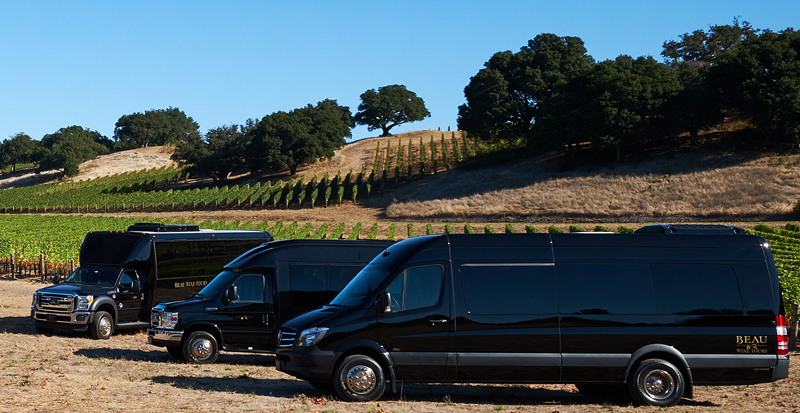 If you are not looking for a private large bus or shuttle service, please visit our Daily Wine Tours page. This is a good option if you are looking for something more economical than a private tour. We utilize luxury limos and limo buses for these fun and informative tours. Are you interested in touring one specific region of Napa? Check out our custom tours! Not sure which area of Napa Valley to tour? Take a moment to check out Beau Wine Tours’ specific routes, including our Napa Valley Wine Tours, Intro to Napa Valley Tour, Discover Coombsville Tour, Spring Mountain Wine Tours, Howell Mountain Wine Tours, and Diamond Mountain Tours. For the wine connoisseur, our Collector’s Tour may be the perfect match. Enjoy! If you are looking for a more economical Napa Valley group wine tour experience, check out our Daily Napa Valley Wine Limo Tours.